Industrial Manipulators, Arms & Automation | KMH Systems, Inc. Positioning devices with almost human flexibility and dexterity, but superhuman strength…just what the industry needs now. Manipulators are specifically designed to perform lifting, rotating, turning, tilting, reaching, and positioning tasks that far exceed human capabilities. Each tooling solution is custom engineered to fill your precise needs. Articulated Jib Booms can be used as an alternative to an overhead rail system or single arm jib. 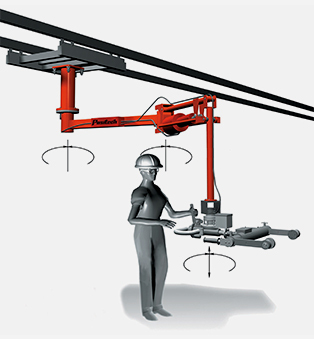 The low headroom design along with two 360° rotation axes, allow this handling aid to reach-in and maneuver over or around work cell obstructions. The AJB is available in five model configurations, provides up to 5,000 pounds of payload capacity and spans up to 20 feet. A Pneumatic LodeArm is a lightweight manipulator that provides excellent maneuverability of payloads up to 275 pounds, increasing worker’s capacity to perform physically stressful, repetitive lifting tasks. 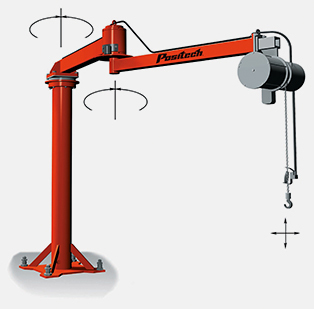 Easily adjustable to fit almost any work cell, a Load Arm is a high-capacity lift system in a compact package. Great for low headroom applications, this manipulator provides rigid support and reach-in capability. It provides up to 54 inches of vertical lift and flexible mounting options. The Taurus Manipulator design emulates the movement of the human arm. 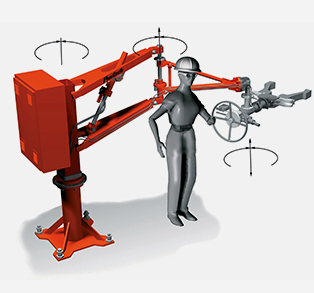 This industrial manipulator allows for reaching-in and maneuvering over or around work cell obstructions. When the handling process requires precise positioning of heavy payloads of up to 2,500 pounds, the Taurus Manipulator’s hydraulic system makes it the ideal choice. Safe, low-voltage, variable speed controls can be hand held, machine mounted or build into ergonomically designed controls. Provides up to 64 inches of vertical lift and flexible mounting options. 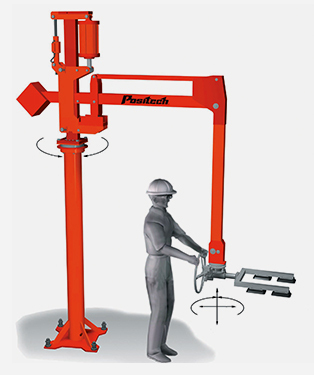 For jobs that require the compliance and float of a pneumatic manipulator, this ergonomic lift assist provides the operator with the highest level of feel and position of the payload. The Simple Air Manipulator uses pneumatic power to provide quick response and superior maneuverability with loads up to 940 pounds. The Simple Air Manipulator’s lift cylinder uses compressed air for vertical lifting and positioning. Can be changed from floor to ceiling mount without arm disassembly. A Vertical Lift Cylinder is ideal for straight line transfers, over-the-assembly line handling and reach-in operations when combined with an overhead rail system or an Articulated Jib Boom. 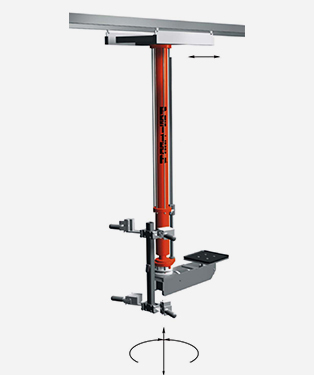 Exceptional off-center payload handling for reach-in applications is derived from heavy duty industry leading design, which uses external cylinder tie rods and dual linear bearings. The Vertical Lift Cylinder is available in four model configurations and provides up to 2,500 pounds of payload capacity.